The large crowd gathers before the meeting begins. 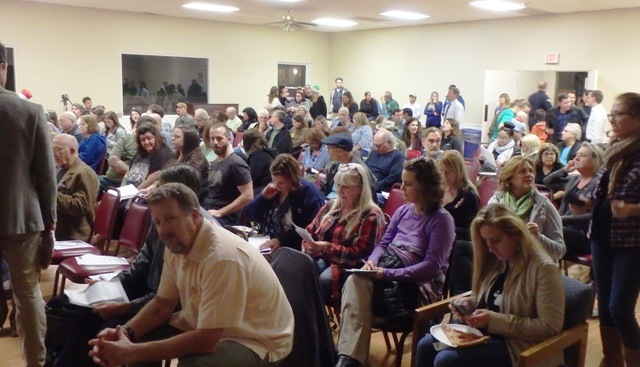 To a standing-room only crowd, with pizza being handed out over on the side, with a couple of TV cameras in motion, Ocean Beach Town Council president Gretchen Newsom loudly gaveled the monthly meeting to order. The crowd of over 200 took their seats in the large auditorium of the Masonic Center on Sunset Cliffs Blvd. Newsom called it a “record turn-out” for a town council meeting and then deftly guided the meeting over the next 2 hours, which included handing out awards for the winners of the 35th Annual OB Holiday Parade, and opening the floor up for non-agenda items during which a number of people aired complaints and issues. The room remained in a near-festive mood throughout the evening and not an uncivil word spoken. Councilwoman Zapf hamming it up with Friends of the OB Library. 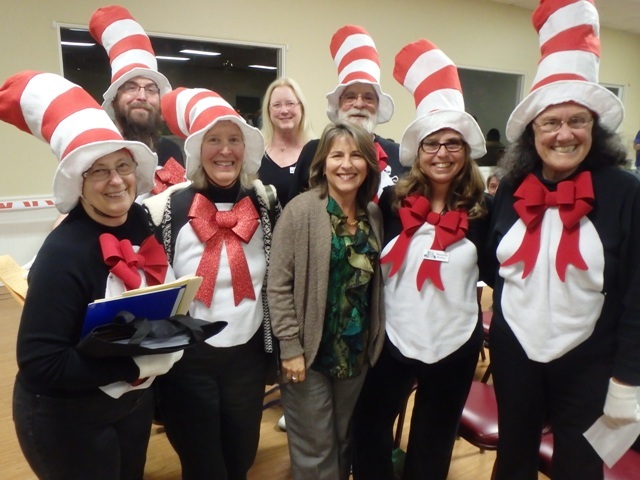 The Friends of the OB Library made a big show, wearing “Cat in the Hat” costumes, and addressed the audience and the Councilwoman about the need to expand the local branch. Also the organizers of the recent “Community Discussion” gave the audience a brief summary of their gathering and issue ideas. 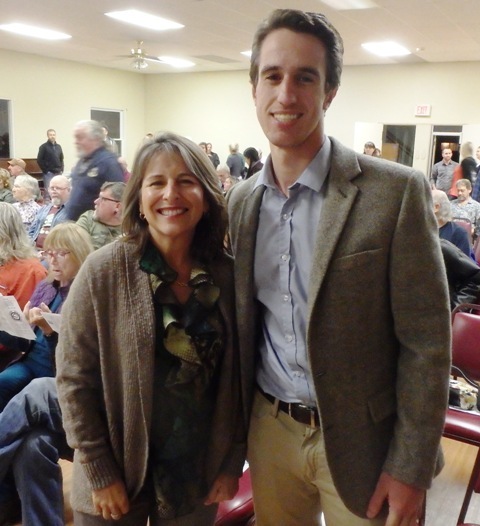 The main agenda item was the introduction of Councilwoman Lorie Zapf, after which Zapf gave a personal tale of poverty as a child, then switched to some of her legislative priorities, and finally fielded questions from the audience. Her aid for the community, Conrad Wear, was also introduced. After the Zapf presentation, Community Relations officer David Surwilo got up before the meeting, introduced the other commanders present, and then launched into sharing a practical perspective on policing, giving an update on the current “crime wave” in OB, advising everyone to lock up and secure their homes, and basically reassuring the community. Newsom handed out the awards to the winners, whose floats included – for the “Family” category – first prize : OB Peace Heads: War Is Over If You Want It. Others included for the Individual – Magician Loch David Crane and the Star Trike; for Merchant – Inn at Sunset Cliffs; for the Neighbors category, it was a tied vote – OB Pause and OB’s Finest Presents “Say you want a Revolution” ; for Organization, it was also a tied vote between the Friendly Sons of St. Patrick and the Dana Middle School Surfrider Club Presents Surfrider Stranded OB Style. The panel of local judges who decided all these included: Tom Perrotti, President of the OB Community Development Corporation; Barbara Iacometti, President of the OB MainStreet Association; Pete Ruscetti, President of the OB Planning Board; Lynne Bolton, Local Artist and co-owner of The Electric Chair and Primitive Kool Gallery; and Pat James, Co-Founder and President, of the OB Historical Society. During the public comment a number of groups and individuals stood up and explained their issue or problem. First up was a half-dozen members of the Friends of the OB Library with their toppling tophats. Judy Collier, the chair of the group, described how during the Holiday Parade, the group displayed their large banner which read “Expand OB Library” and received cheers from those lined up to watch the parade. Collier said the expansion of the library is the “number one priority in the public financing plan” of the OB Community Plan. In 2016, she said, the library will be one hundred years old and that would be a great year for the expansion. Petitions supporting the expansion were handed out to the crowd. Liz, one of the organizers of last weeks community discussion on crime, and her cohort explained that a hundred people had attended their meeting, and they came up with 5 areas of concerns. Those included the criminal behavior of the homeless, public urination, aggressive panhandling; litter and dog poop; thefts and the home invasions; public awareness; and vandalism, graffiti, and tire slashing. They are working to learn how to form a neighborhood watch, and learning what’s permitted and not permitted, what’s cit-able and what’s not. But they don’t want to reinvent the wheel and want to learn from the other earlier efforts. Three women with sight disabilities – 2 had guide dogs – got up before the crowd and described how they have trouble walking on the sidewalk in front of one of OB’s more famous restaurants, the OB Noodle House on Cable Street. They all live in OB and love its freedom of travel. Their concerns however are about the restaurant’s number of tables outside on the narrow sidewalk, their customers stand around as there is no place for them to sit, some people leave and tie up their dogs outside – some of whom lunge at the guidedogs, and often cars are waiting in the alley for their take-out food and make it difficult to cross. Carole Landon-Stone, a longtime resident then got up and talked about how some OB sidewalks have dangerous high raises between the sidewalk and the adjoining parkway, that she has tripped numerous times on them, even breaking an arm. Dave Martin told the audience that the Veterans’ Plaza is in the permit stage now. A 3-D replica of the Plaza is at Shades restaurant for viewing. Nicole Burgess made a pitch for ideas, as she’s the area rep for the City’s Bike Coalition. Back on the agenda, it was announced that the Town Council collected $2018 in its Toy Drive, double the amount of last year, and that this helped pay for a full week of groceries, a turkey, and toys for kids for 90 families last month. The Council’s treasurer reported that it has $40,145 in its bank account. Councilwoman Lorie Zapf and aid Conrad Wear. Councilwoman Zapf was next and she told the crowd that she was thrilled to be there, that it was “an awesome crowd” and that she would return many times in the future. She gave her background; she grew up in LA, her mother’s side of the family was from Mexico, and while in LA when she was young, the family lived on food stamps and welfare. At some point the family broke up and Zapf was placed in a foster home. Due to this personal history, she said “I have genuine empathy for good government services,” like libraries, parks and recs. She used to be in broadcast journalism, she said, on the radio in the Lake Tahoe and Las Vegas areas. Zapf moved to San Diego 20 years ago, and has lived in Clairemont most of that time. She told the audience that she used to run a vegan natural food company, even sold her products at People’s Food; she ran it, she said, and sold it in 2003. On the city level, Zapf outlined some of her priorities, with number one ensuring that police officers have sufficient benefits to prevent them from leaving for other jurisdictions where they can receive higher pay. She iterated the traffic circle idea, saying other communities have found them useful. Zapf admitted she’s new to the district, is accessible, has office hours in the communities she serves and urged people to contact her, her aid Conrad Wear in writing. During questions, this reporter asked Zapf whether the OB Lifeguard station replacement is in the 5 year plan for lifeguard services, as the restrooms are deplorable and the station itself unsafe. Zapf and Wear assured the room that it was on the list. John Ambert of the Planning Board asked a similar question, pressing her if there could be a coupling of a police station with a new lifeguard station, even with different sources of funds for each. Former Councilman Ed Harris even got a brief speech in about inadequate infrastructure and the needs assessment of the community. Other residents had other issues. A homeless man had some complaints he wanted to make to Zapf privately. One man suggested that OB have installed electric vehicle charging stations. Craig Klein suggested that there are discretionary city funds for such things as pot holes, and that the alley just south of Newport was horrible. Susan Peinado asked whether the city had to suffer through another fiasco as occured with the oversight committee for Balboa Park, and how there’s aneed to tighten up city oversight of contracts, such as the one with the managers of Belmont Park. Upon questions from Gretchen Newsom about how to address the different funding needs and the constraints of the city budget, who suggested an infrastructure bond, Zapf launched into her conservative slant. She explained that because OB is an older neighborhood, already built-out, it doesn’t get the funds that newer communities receive from developer fees for libraries and parks. She went on to advocate that communities can figure out ways to pay for the public amenities themselves by agreeing to such a bond, which is another way of saying, ‘hey, if you want it, you pay for it,” instead of finding ways from the General Fund or Capital Improvement Fund to finance the resources that make up a neighborhood. Zapf finished with a statement that she remains “a skeptic of government,” but the crowd gave her a genuine round of applause at the end. The next lengthy speaker was Community Relations Officer David Surwilo who assured the community that in terms of the recent spike in crimes in OB, the police are doing everything they can. He also handed out a map of the beats of the Peninsula and a chart that compared the last two months of crimes with a year ago. OB is mainly within Beat #614. Surwilo’s main focus was in describing how there has been 8 break-in incidents, and the robbers are described as African-American in 3, a white man with spiked hair in 1, and 4 are unknown. None are alleged to be homeless. They steal small items, between the morning hours of 3 and 5 a.m. Surwilo explained, like lap tops, change, shoes and then quickly get out. His main complaint was that OBceans keep their homes and personal things unsecured. The chart he handed out actually showed a decrease in crimes in OB from a year ago, such as residential burglaries and car prowls. And he tried to give the crowd perspective. “Hillcrest,” he said, “Has just as many homeless, as many [police] calls.” He also pointed out that other cities of comparable size with San Diego “have more officers”. After Surwilo spoke, the clock inched towards 9pm and folks were leaving. There were political reps who gave their usual spiels, and finally Gretchen said we could go. After all the talk, charts and explanations from SDPD, the message was lock your doors, because you’re on your own in OB. I think that’s a little shortsighted of a take. I think it’s, we’re doing the best we can given our resources, time for the community to step up and fill the gap in community safety. Police can’t go around locking our doors, windows and cars for us. It’s time for the community to step up and do it’s due diligence in keeping us all safe. Nice try. So the Republicans cut the budgets for police, & firefighters, and then expect the citizens to supplement their own protection? Did I get that right? Why aren’t people looking their door and windows anyhow? So now the criminals know to come to OB because their are people that leave the property unprotected and that puts the rest of the community in jeopardy. Is this not similar to leaving your keys in the ignition? Kind of just plain dumb? Awesome turnout. One small step for humankind; one small step against fascism. Bummer about the war memorial, though. Again . . .
You’re right, by time I wrote that I was almost too exhausted to think clearly. This comment was me trying to use the “Reply” option from my phone to jettyboy’s above comment. Can I remove this comment so that it’s in context. Thanks to much for this excellent coverage of this unusually important O.B.T.C. meeting. I couldn’t be there but, with the coverage, feel almost like I was. Regardless of Ms. Zapf’s political persuasion, I am pleased that we have her as a our Council Rep with such a breadth of life experiences many unusually humbling. Here here. Exactly why I come to the Rag. Thanks for the coverage Frank. I was just happy to see she (Zapf) didn’t arrive on a bulldozer like the union/pro Boot mailings suggested. Anybody remember that mailing? It was a goofy caricature of Zapf plowing through a mythical park on a bulldozer in pursuit of a little boy and girl. There was also a cute little flower about to get crushed. Ahhhh. And Frank, what were you trying to insinuate when asking Lorie about her last name? Were you somehow implying that her ethnic (Mexican) and poor economic upbringing was a lie? Seemed a bit low. No, not really, I was sincerely interested in her other ethnicities, as I am also part German – as her hubby apparently is. Actually, if I did wish to imply anything, it would have been after all that tale of poverty, foodstamps, welfare, adoption, etc, how the heck could she still be a Republican? Funny comment, though, about Zapf not arriving on a bulldozer. Anyone who believes everything Ms. Zapf has to say is making a serious mistake. There are so many inconsistencies about her past that I would think it prudent to verify some of what she has said and not take it as gospel. That would go for any politician of course. This reads as a disappointingly tepid response for building the new/expanded O B Library from our Councilwoman Zapf. Perhaps she will clarify that she will go after city funds like a bulldog, so as to meet our pressing needs. The needs are not about air conditioning only, after all. The new developments she refers to as “communities” don’t receive developer fees. That money is set aside to build public improvements that do not exist such as libraries and parks, the “communities” do not control that money. Older communities like OB, and like the newer communities will one day be, are supposed to be covered by the City’s Capital Improvement Fund. Ocean Beach is not an entity that can float a bond, that suggestion demonstrates something about Ms. Zapf’s knowledge of these things. The library is a CITY facility, why should the people of OB finance improvements to a CITY facility, that is what we all pay taxes for. This answer was ludicrous and it sure sounded like she has no plans to look into finding the City money to do this. As the article said, the answer was, You’re on your own. And she got a genuine round of applause for that? Geoff, agreed! I was appalled when she suggested WE come up with money to improve things. What gall!! And until she changes her thinking about that and marijuana dispensaries (she seemingly deplores them) she’ll get no support from me. Oh how I wish Ed Harris was able to run for that office. His statements when he stood and spoke reminded me how much I enjoyed his short run as interim council person. We are in total agreement on this. That’s why she (Zapf) is a Republican and you’re not. No argument there. And, by the way, I forgot to also compliment you on a detailed and informative article again. Nice job. Last night I miss spoke when I stated “6000 cites in 6 months”. I should have said 6000 calls for service in 6 months and 1200 cites during that time frame. I sincerely apologize for my incorrect statement. Officer Surwilo introduced Lt. Jason Weeden, Lt Keith Lucas – acting West Div Capt. and Sgt Resch (uncertain of spelling). Note: Conrad Wear is the son of Byron Wear, a past councilman for the same district. Conrad is responsible for advising Councilmember Zapf on policy to the City of San Diego Committee on Infrastructure while also serving as her Council Representative for the communities of Point Loma and Ocean Beach. A native San Diegan and Point Loma resident, Conrad graduated from the University of California, Berkeley where he earned his Bachelor of Arts degree in Political Science and a minor in Public Policy. Prior to joining District 2, Conrad worked for Councilmember Zapf in District 6 as her representative to the community of Rancho Penasquitos, and served as her policy advisor to City of San Diego Budget Committee and the San Diego River Conservancy Governing Board. In the past, Conrad has worked summers as a Camp Leader with the Peninsula YMCA and interned as a research assistant with the San Diego Padres while attending the Gary and Jerri-Anne Jacobs High Tech High at Liberty Station. He is also a member of the San Diego Sigma Chi Alumni Chapter, Cal Berkeley Alumni Association, and is an Eagle Scout. On the weekends, he enjoys experiencing all the great things San Diego’s beach communities have to offer. Maybe Mr. Byron Wear can help out Conrad with connections for some donations to get that Library built? Why are we not connecting what has been proven, the $2.5 million Balboa Park Centennial Celebration fiasco (which citizen watchdog Lundin exposed with great effort) to every other deal with the city? Let’s start with city leases-first up is Belmont Park, before we start boohoo-ing about how poor we are and that citizens need to pay for what they are asking, in addition to our property and other taxes. So we pay twice. Once for the corruption, the sweetheart deals, and then for the breakdown of services and infrastructure. We need more transparency and accountability before we hear our elected officials tell us we need to pay twice for what we want. Susan, good points, and obviously some of us do connect the dots. How about a “citizens’ advisory committee on Belmont Park” made up actual representatives of the neighborhoods closeby? Did Zapf have anything to say about the sidewalks? They are in terrible, treacherous condition throughout OB. I am astonished that people living in OB leave their doors and windows unlocked. Thank you, Frank, for your accurate, detailed account of a very long meeting. I really appreciate your reporting style–factual, but acknowledging your point of view. Incidentally, we had more than the 6 Cats in Hats from the OB Friends of the Library. Several were in the audience and several at the front tables. I was happy that Councilmember Zapf acknowledged the very real needs of the OB Library, which we had pointed out to her when she visited the library with us several months ago. I was happy that she acknowledged the importance of libraries in her personal life. I think that we are going to need to work with her and with other elected and non-elected officials to identify funding sources. I would like to see all possible solutions brought to the table, without partisan labeling. And, UNWASHEDwallmartTHONG, if you are not already a member of the OB Friends of the Library, we want you! You can get an application at the Library’s front desk. Thank you to the entire OB Community and beyond for your support! I could lose my anonymous mantle. Take it from me, you should lose your anonymous mantle or find another.